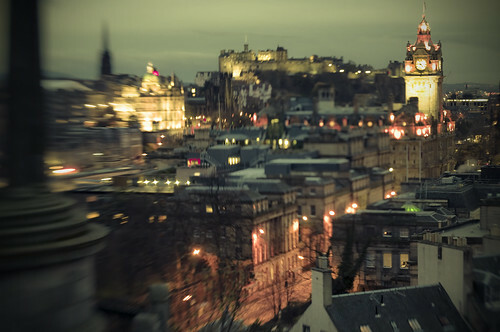 Now, as a 55mm lens with selective focus the lensbaby is not what you would describe as a “normal” lens for landscape shots, let along night-time cityscapes. Usually, for this kind of shot I’d go armed with my Nikon 18-70mm f3.5/4.6 DX or my Sigma 10-20mm lens’s but for something different, maybe next time your out and you’ve got access to one, give a lensbaby a try? If you know the Lensbaby product then you’ll know what the Muse version will be no good in this situation as it has to be used handheld, but if you have a Composer or even better, the Control Freak (or older 3G) then your good to go. First things first, before you set out think about where you’re going to go. You want somewhere you can get a focal point to sit in the sweet spot of the Lensbaby, it’s no good just pointing it at a random scene and hoping for the best, you need something you can focus on easily. So, with a location with a clear focus point in mind, change the aperture ring now and aim not to change it in the dark when your out, it’s fiddly enough in light never mind in the dark. Now normally, you’d go to the f16 range for these shots but in this case we want blur but not too much, so stick on the f5.6 aperture ring. Whatever you do, don’t go above f8, if you do, you wont have a hope of focusing as there will be so little light getting to the viewfinder you won’t see enough to get an accurate focus. With the f5.6 aperture ring fitted your normal 30s or so exposures will be a lot shorter, in complete darkness looking over a city you’ll be in the 6s to 8s range with the ISO set at 200. Start there and adjust as needed. 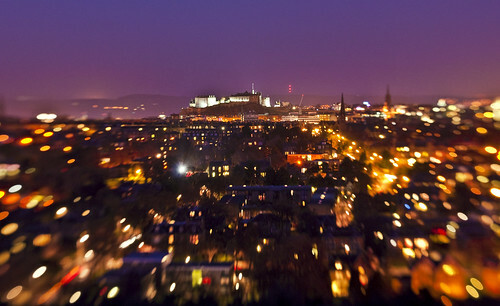 Once at your location and your setup, pick your focal point, in the shot below, it’s Edinburgh Castle. Adjust your focus to get the focal point in sharp focus and try your first exposure around 6s. Too dark, lengthen the exposure, too light, shorten it until you get what you want. The end result should be as below, the focal point in sharp focus with the lights of the city blurring in towards it in a bokeh effect. A unique effect you couldn’t do with any other lens and something very different. 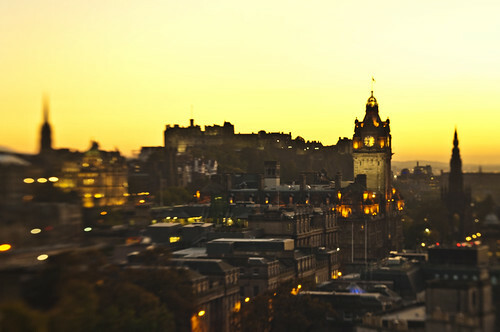 In this shot, the focal point was the clock face of the Balmoral Hotel clock and everything else blurs towards it. In this sunset shot, the focal point is the clock face again. Give it a try next time your out doing night city shots, the lensbaby is great for portraits and flowers and the likes but for something very different from the norm why not try your landscapes with one?